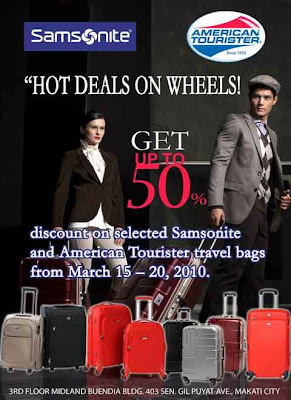 In 2008, there was this GRAND luggage sale in Binondo that had Samsonite, American Tourister, Delsey, etc and a couple of footwear and sporty brands. My sister, brother-in-law and cousin went all the way there on my birthday just to go to the sale. It was awesome. My "Asia" maleta came from there at 40 or 50% but the real steal was my cousin's hard shell Samsonite malete, from P11,000-P13,000 she got it for around P4,000 only. This may not be the same organizers and it's limited to just 2 brands, check it out! You're sure to score items that are of good quality so how can you go wrong? It's only from March 15 - 20 in Makati. I will shop vicariously through you since I dont have luggage needs anymore.